90% of the businesses I meet believe they have a unique selling point (USP) yet in truth, it turns out to be generic and doesn’t make them stand out from the crowd. Is it really important to have a USP? 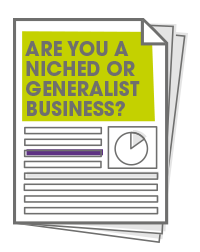 Is it better to be a niched business or a generalist? What makes you truly different? I work with many clients to help them better understand their current market position and plot where they would like to be, and how to get there. Businesses who offer a niched service will always come across as specialists and will be competing against a smaller pool of similar companies. Niched businesses should be able to ‘speak the language’ of their market place and demonstrate a deep understanding of their potential customers’ needs. This has to be more appealing to prospects and give them the confidence that you understand and can help them. But does being niche preclude you from other opportunities? A wise person told me start niche and then go wide. With this approach, being niche doesn’t stop you from working with other industries or sectors, it just means your starting point is niche and it gives you a clear message to market. I have written a short whitepaper on the subject. This is an important topic and one that affects every business that works in a competitive market place. To receive the whitepaper, simply click here.